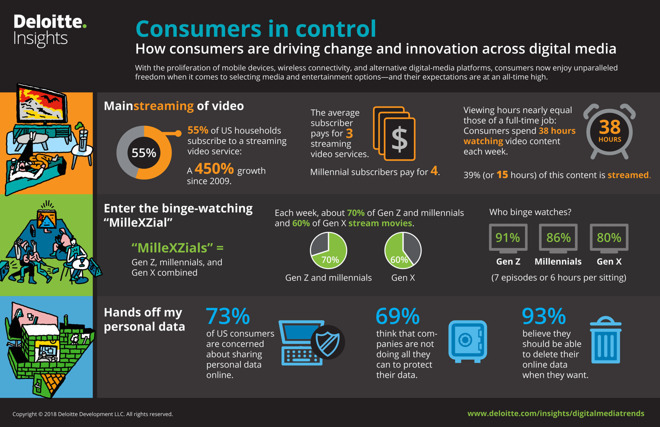 The 12th edition of Deloitte's Digital Media Trends Survey found that 55 percent of U.S. households now subscribe to at least one streaming service, and the average streaming video subscriber is paying for three services. Also, more than 48 percent of U.S. consumers stream television content either every day or weekly, a number that was just 37 percent last year. And those subscribing to specific services are largely driven to do so by exclusive content. The news from the survey bodes well for Apple's ambitious content plans, as it shows a consumer trend towards getting streaming content from more than one source. Whatever form Apple's plans take, it won't necessarily mean customers bailing on Netflix, Hulu or Amazon Prime. It's also likely that a lot of those streams are using the Apple TV to do so, although the survey isn't broken down by device. "Consumers now enjoy unparalleled freedom in selecting media and entertainment options and their expectations are at an all-time high," Kevin Westcott, vice chairman and U.S. media and entertainment leader, Deloitte LLP and author of the survey said in the announcement. "The rapid growth of streaming services and high quality original content has created a significant opportunity to monetize the on-demand environment in 2018." The survey also drew conclusions about generational approaches to content, finding that more than 60 percent of Gen Xers —most of whom are now older than 40 —stream movies. Apple's Eddy Cue talked about Apple 's still relatively amorphous content plans at the South by Southwest festival last month. Cue stated that Apple is "all in" on content, although he stated that, contrary to Netflix, "we're not after quantity, we're after quality." Apple so far has announced a handful of high-profile projects, including a drama starring A-listers Reese Witherspoon and Jennifer Aniston, a partnership with rapper Drake and "Central Park," a new animated musical series from the creator of "Bob's Burgers."